Gossips has been watching the signs change on 400 State Street for the past week, but between this morning and now, another sign has been added. This Sunday, September 4, from 3 to 6 p.m., the Alliance for Positive Health (formerly the AIDS Council of Northeastern New York) holds its annual Garden Party. This year the event will take place at a mid-century modernist retreat on the grounds of a historic Livingston estate in Germantown. Enjoy a relaxing afternoon in a spectacular landscape with breathtaking views, while savoring comestible delights and sipping a signature cocktail or select wine. Reservations for the event can be made online until 5 p.m. on Friday, September 2, by clicking here. Yesterday, a tree that graced the 600 block of Warren Street and provided shade and the many other benefits of urban street trees was cut down. Thinking the Department of Public Works was responsible for trees on Warren Street, Gossips asked Rob Perry, DPW superintendent, if he would comment on why the tree had to come down. He responded that DPW had no part in cutting down the tree. The presence of street trees--especially on our main street-- benefits us all; the loss of a street tree diminishes the quality of life for us all. 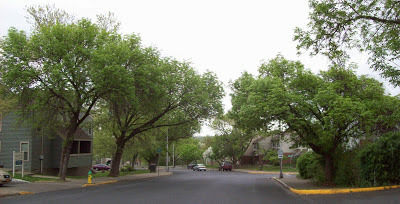 For a decade, there has been talk about establishing a Tree Board to develop a master street tree plan for the city and to encourage the maintenance and preservation of our existing street trees and trees located in public parks and near municipal buildings. 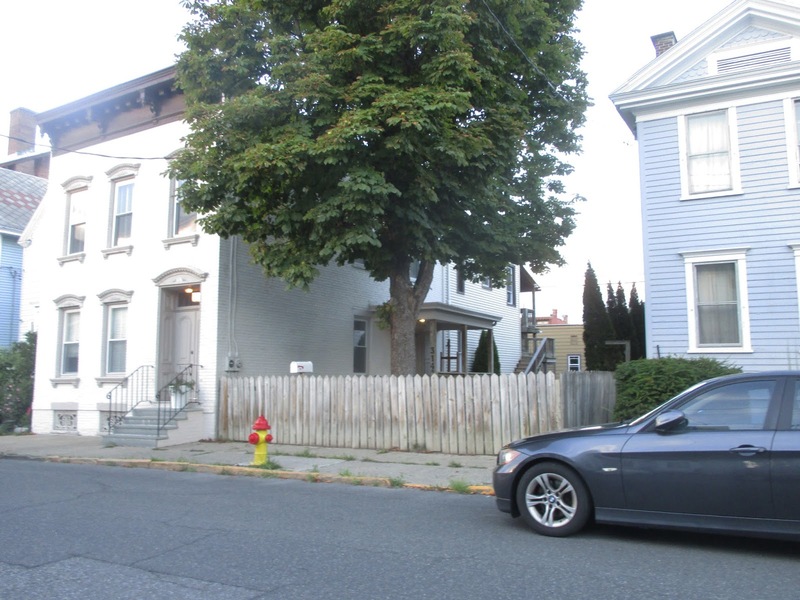 One of the Tree Board's responsibilities might be to assess the health and viability of street trees proposed to be felled, to prevent trees, which enhance the city and benefit residents and visitors alike, from being cut down for no good reason. It's time to think about establishing a Tree Board again. It's possible a Tree Board could have acted more quickly to get the ash trees on North Front Street treated and protected from the emerald ash borer, and the City would not now be facing the loss of those trees. About a week ago, Gossips reported that the sign identifying 400 State Street as the Hudson Area Library had been replaced by one identifying the building as owned by the Galvan Foundation and suggesting by the contact information provided that the building might be available for development or maybe even acquisition. 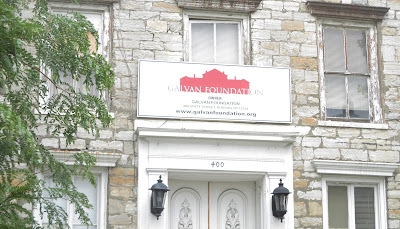 Two days later, that sign was gone, replaced by a sign over the door that simply said "Galvan Foundation." Yesterday, Gossips noticed that sign had been replaced by another sign with the red Galvan logo--the silhouette of the very building on which the sign had been hung--identifying the Galvan Foundation as the owner of the building and providing contact information for the foundation. Living up to its name, Gossips has been reporting intel from the field about what's happening on the 300 block of Allen Street. 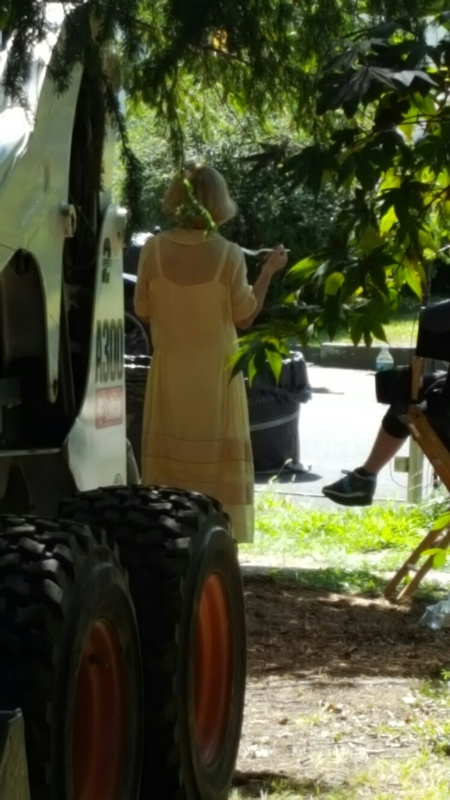 This afternoon, a reader snapped this picture of Christina Ricci, taking a lunch break in the shade. 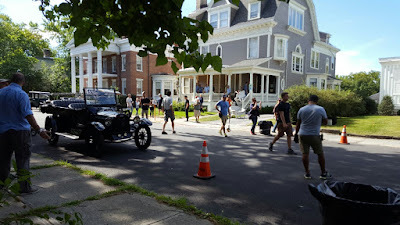 The picture enabled me to put two and two together and figure out that what's being filmed today in Hudson is not a movie but part of the Amazon Studios television drama series Z: The Beginning of Everything, which is based on Therese Anne Fowler's book Z: A Novel of Zelda Fitzgerald. The pilot debuted in November 2015, and the first season is scheduled to be released on February 10, 2017. Since yesterday, the 300 block of Allen Street--sometimes known as the stately homes block--has been abuzz with preparation. The center of the activity is 339-341 Allen Street, the Ca' Mea Inn, whose graceful Queen Anne front porch is being draped with wisteria to transform it into a sultry southern setting for an Amazon Original film about F. Scott Fitzgerald and Zelda. 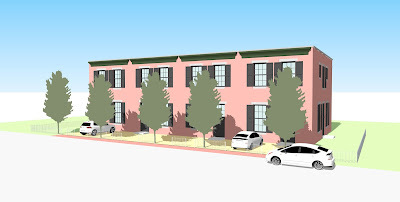 In the summer of 2014, a proposal to construct a four-unit apartment building at the corner of Fairview Avenue and Bayley Boulevard went before the Zoning Board of Appeals for an area variance and the Planning Board for site plan approval. The project got its variances and approvals, with no one speaking against it at either board's public hearing. 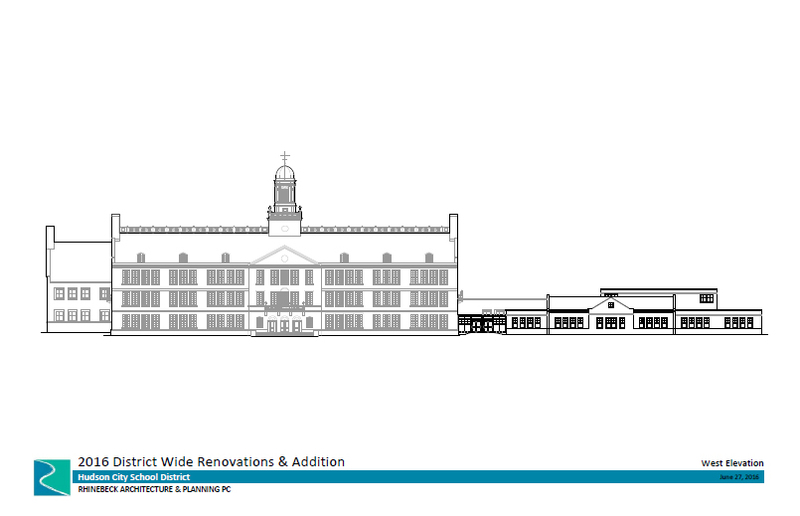 Although there was some concern the proposed building was too large for its location, there was also appreciation for the attempts to make it architecturally compatible by including such Arts & Crafts details as six over one windows. Two years later, the neighbors are not as sanguine about the project as they once were. A great hole was dug, and a concrete block foundation was built, but that's where things stopped. For a year, people living on Bayley Boulevard and Jenkins Parkway have had to pass an unattractive construction site to enter their neighborhood. Gossips spoke yesterday with code enforcement officer Craig Haigh about the project. Haigh explained that a family tragedy and other setbacks had prevented the owner/builder from proceeding with the project in a timely fashion. 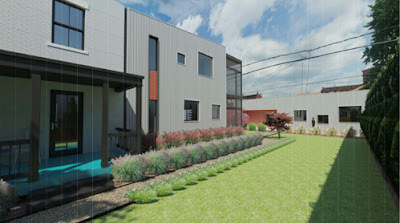 Building permits are only effective for one year, but because of the circumstances, Haigh had granted a six-month extension on the building permit for this project. The six months will be over in a few weeks. According to Haigh, the owner/builder is now ready to resume construction, but before he would allow them to continue, Haigh requested an engineer's report on the foundation, which has been exposed to the elements for a full year and last winter had to be pumped out because it had filled with water. After Haigh has reviewed the engineer's report and any repairs required for the foundation have been made, the construction can proceed. Haigh noted that unless the building can be completed within a few weeks, which seems unlikely, the owner/builder will have to apply for a new building permit. It's not uncommon these days for people to grumble about the level of care provided to our parks and public green spaces. The DPW crew always seems to be short-handed and stretched thin mending water main breaks and repairing City-owned vehicles, leaving little time for manicuring the municipal parks. 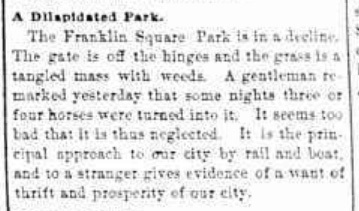 Apparently, this is not a new thing for Hudson, as evidenced by this rant, which appeared in the Hudson Daily Register for October 11, 1889, about the sorry state of Franklin Square Park. 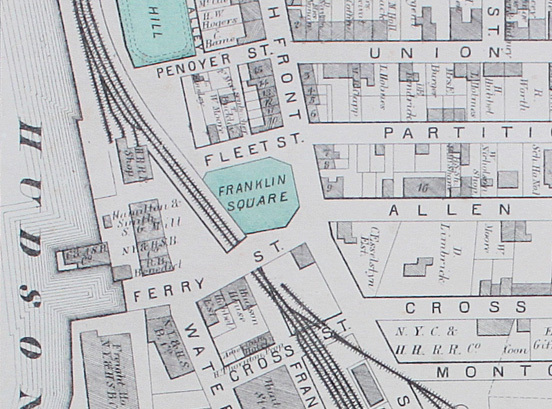 Before Urban Renewal re-imagined Front Street in the 1970s, Franklin Square Park was located at South Front and Ferry streets, where there now is a parking lot for Hudson Terrace apartments. Gossips has been raising the alarm for years about the emerald ash borer and its fatal threat to ash trees. The principal concern was for the ash trees that were planted along North Front Street during Urban Renewal--today forming a leafy arch over the street that makes that part of the city seem lush and welcoming. An opinion piece in the New York Times yesterday cites another reason why we need to defeat the ash borer and save our ashes: baseball, our national pastime. White ash is the classic wood for baseball bats; 25 percent of all bats are still made from white ash: "A Bug That Eats Baseball Bats." 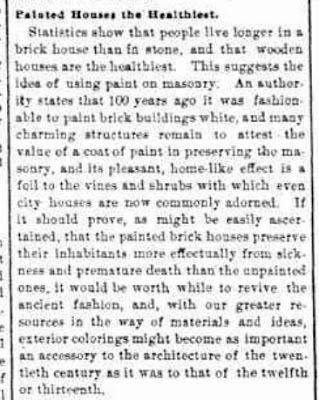 Considering the number of brick buildings in Hudson that have had their paint removed in recent years, it's interesting to discover that in 1889 it was suggested that painting brick houses could improve the health and increase the longevity of their inhabitants. 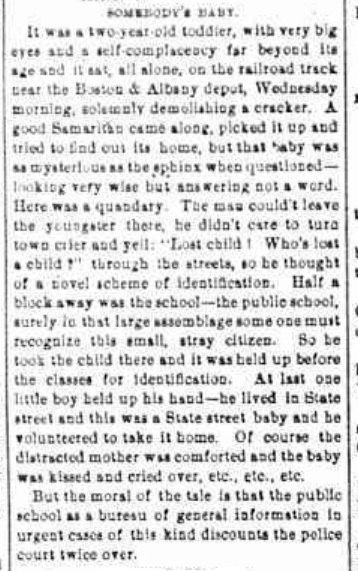 This article making that assertion appeared in the Register-Star for October 9, 1889. With 19th-century newspapers, it's not always immediately clear what's news and what's advertising. Advertisements for products often appear as little news items. 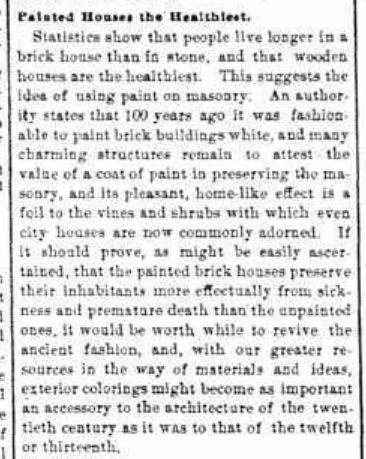 For this reason, the article that immediately followed the one that claimed painted houses were healthiest raises questions about the article's unbiased veracity. 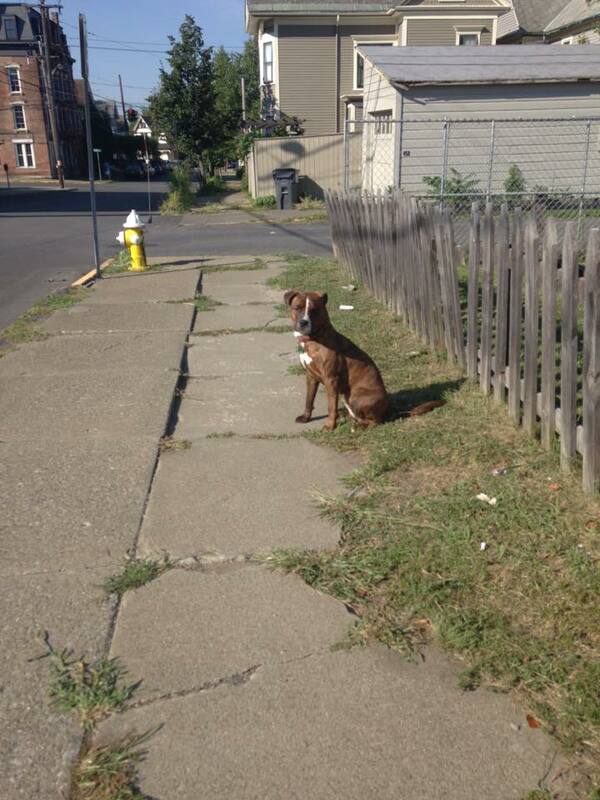 Yesterday, this picture of a dog, loose and alone on Fifth Street near Cherry Alley, was posted on the Hudson Community Board on Facebook. Within minutes, the dog's human was identified, and she was back home safe. I was reminded this morning of how we now use Facebook to reunite pets with their humans when I came upon this item in the Hudson Daily Register for September 28, 1889. The Boston & Albany depot where the toddler was found was this one, known as Hudson Upper Depot, which still stands at State and Seventh streets. 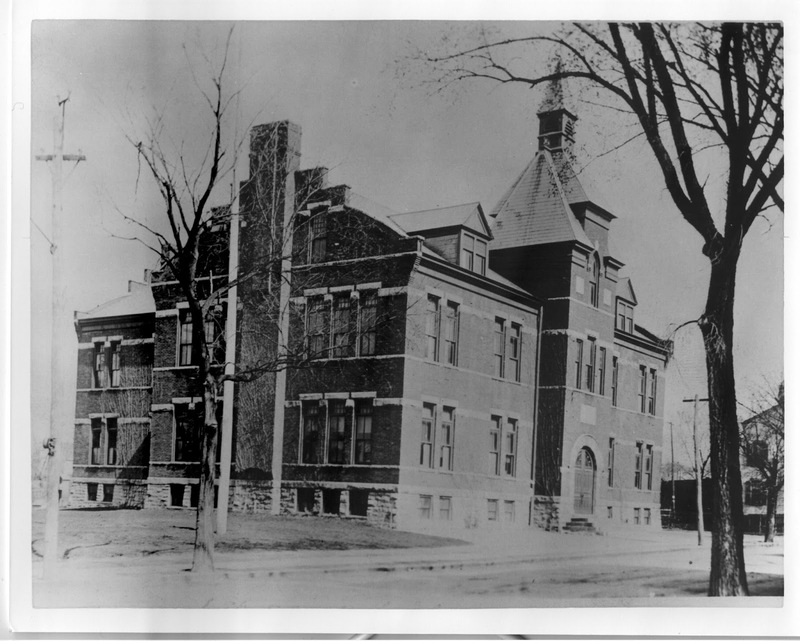 The school to which the good Samaritan took the child was the Sixth Street School, now the location of the Public Defender's office and other county offices. Last week, Darrah Cloud and David Simpatico wrote about their excursion to the Ancram Opera House to see a performance of In Praise of Elephants. Their review in the Poughkeepsie Journal--of the play and the venue--is recommended reading: "Ancram Opera House an experience inside and out." Next weekend--Labor Day weekend--the Ancram Opera House presents Joseph Keckler, with Dan Bartfield on violin and and Matthew Marsh at the piano. Stephen Holden in the New York Times described Keckler as "a singer whose range shatters the conventional boundaries of classical singing." Infused with humor and longing, Keckler's material includes operatic renderings of contemporary life and haunting torch songs. The concert is on Saturday, September 3, at 8:30 p.m. For those who don't relish the prospect of finding their way to Ancram and back along Route 82 in the dark, there's a bus that will leave from the Red Dot at 7:45 p.m. bound for the Ancram Opera House, with Trixie Starr as the chaperone, and return back to the Red Dot after the performance. For more information and to order tickets, go to www.ancramoperahouse.org or call 518 329-0114. New "novelty siding" would be installed on the garage, and the windows on the garage would be double hung to match those on the addition to the house. New additions, exterior alteration, or related new construction shall not destroy historic materials that characterize the property. The new work shall be differentiated from the old and shall be compatible with the massing, size, and architectural features to protect the historic integrity of the property and its environment. At some point in the discussion, HPC member Miranda Barry asked if the Secretary of the Interior's Standards--the national standards for historic preservation--were incorporated into Hudson's preservation law, because "our code does not include the paragraph the applicants are citing to justify what they are doing." HPC member Phil Forman took it upon himself to answer the question, delivering a lengthy response in which he suggested that the "Philadelphia standards," design guidelines published by the Preservation Alliance for Greater Philadelphia, were of equal importance to the Secretary of the Interior's Standards. Barry noted that Forman's response did not answer the question. No one on the HPC could answer the question adequately. Barry's question is an important one. Back in 2009 or so, a disgruntled applicant for a certificate of appropriateness, who happened also to be a lawyer, maintained that the HPC's reference to the Secretary of the Interior's Standards to justify their decisions could not protect them from being accused of making arbitrary and capricious decisions because the standards where not explicitly referenced in Hudson's preservation law. This incident inspired the First Ward alderman at the time to bring the issue before the Common Council Legal Committee, proposing that Hudson's preservation law be amended to make explicit reference to the Secretary of the Interior's Standards. That initiative--even though it was argued that the City of Hudson could not become a Certified Local Government, a status with the potential to bring benefits to the City, if the HPC was not operating in accordance with the Secretary of the Interior's Standards--got no traction. At some point, the HPC voted to use the Secretary of Interior's Standards as their guide in decision making, but that vote was never memorialized anywhere, and no member of the current HPC has any recollection of it. It is high time this was remedied and the preservation law amended to make reference to the Secretary of the Interior's Standards. Last week Thursday, when the Common Council Economic Development Committee met to discuss preparing a request for proposals for the Dunn building on our waterfront, Bill Roehr, of TGW Consultants, who will be drafting the RFP, brought with him as an example of what an RFP should be, one that has written in 2011 for the redevelopment of Monument Square in Troy. 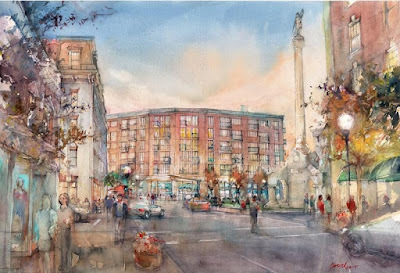 Coincidentally, earlier this week, WAMC reported on the current state of redevelopment plans for Monument Square: "After the failure of three development proposals and two builders, the city is turning to its residents to offer up what they'd like to see on the River Street site." You can hear or read the entire story here: "Troy Taking Input on Downtown Development." 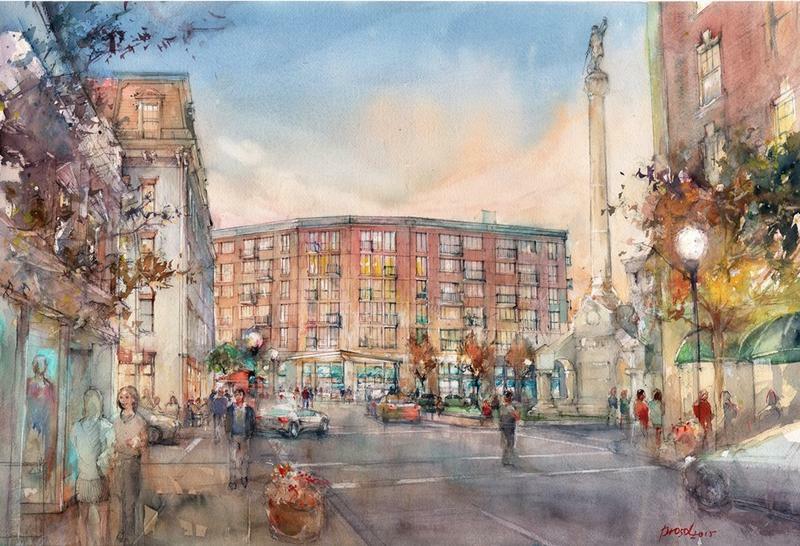 In the report, the mayor of Troy, Patrick Madden says of Monument Square, "This is a very important site in the downtown. What we do there will have a significant impact beyond our lives." The same can be and has been said of the Dunn building and the adjacent four acres along Water Street. Why is no special effort, beyond a public hearing on the draft RFP, being made to gather public input about its development? 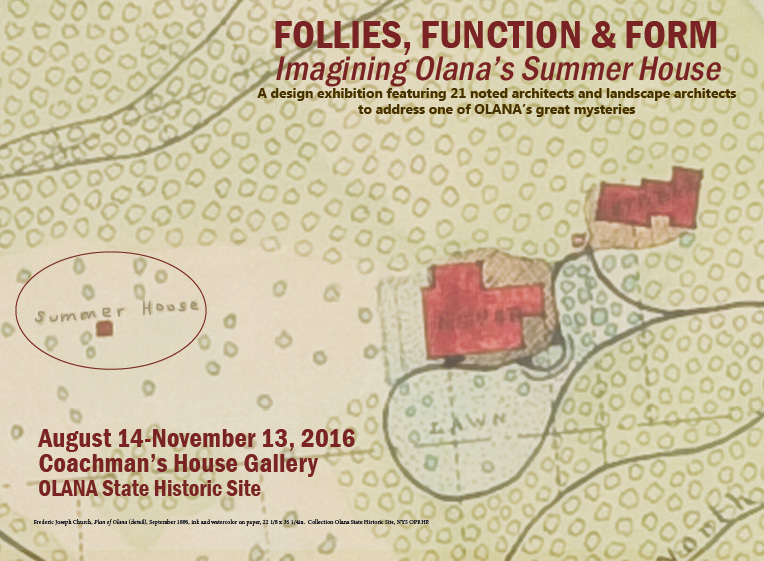 Whether you've already seen the current exhibition at Olana, Follies, Function & Form: Imagining Olana's Summer House, or if it's still on your list of things to see, yesterday on WAMC, Joe Donahue interviewed Mark Prezorski, landscape curator for The Olana Partnership, and two of the participants in the exhibition: architect Joan Krevlin and landscape architect Laurie Olin. If you missed it yesterday, you can hear the interview now by clicking here. 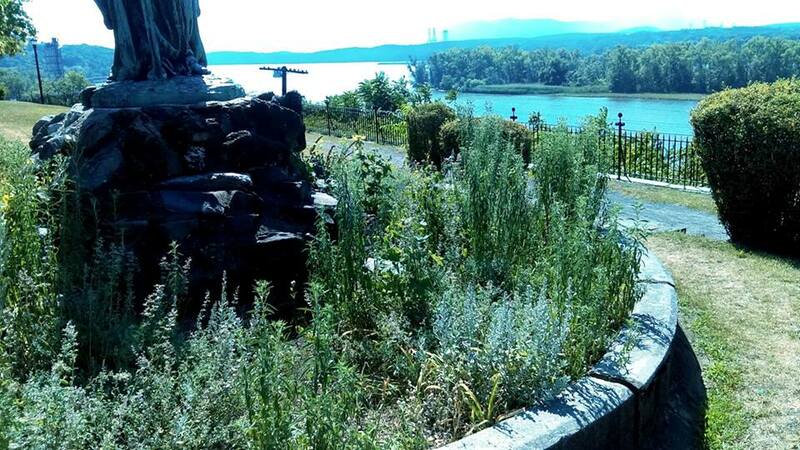 In April, Mayor Tiffany Martin Hamilton announced that funds to rebuild the Ferry Street Bridge had been secured through the New York State Department of Transportation. The disappointing part was that the actual construction of the bridge could not begin until 2020. Prepare transfer resolution in October from capital reserve to a capital account to begin preliminary design, right of way and incidentals, and final design. Perry explained that no part of the project can begin before October 1, 2016, because that is the first day of the federal fiscal year 2017. 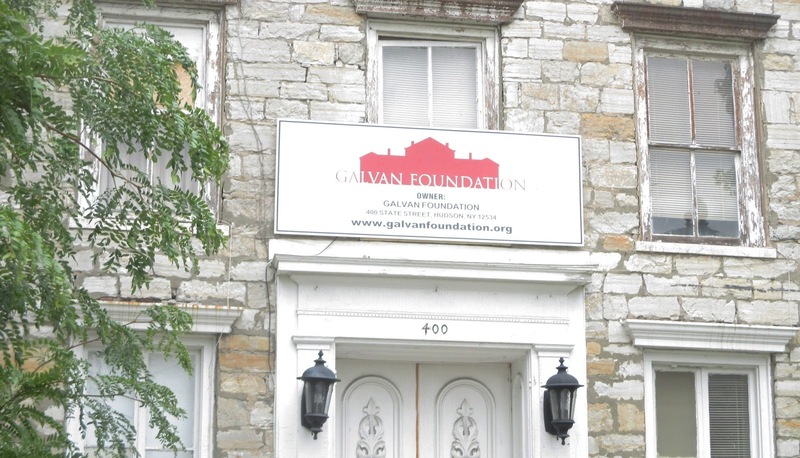 The City will receive $250,000 in the first round of funding. There is also $600,000 in a capital reserve fund established for the bridge at the end of 2015. The Columbia County Tourism recently issued a press release reporting the findings of a study entitled "The Economic Impact of Tourism in New York State," which was commissioned by the State and analyzed 2015 data from Columbia, Dutchess, Orange, Putnam, Rockland, and Westchester counties and found that tourism spending is growing fastest in Columbia County. The press release is quoted below. Of the six counties comprising the Hudson Valley region, Columbia County continues to grow its tourism sector having the highest percentage of its labor force supported by visitors than any other county in the Hudson Valley, according to findings in a recently released report. In “The Economic Impact of Tourism in New York State,” a survey commissioned by the State and prepared by the company Tourism Economics, analysis of 2015 data from the counties of Columbia, Dutchess, Orange, Putnam, Rockland, and Westchester show how tourism, as an industry, is of key importance to local economies. 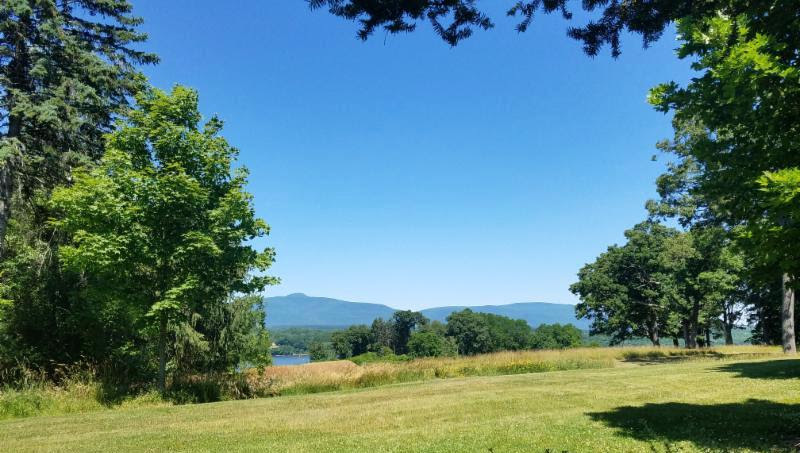 Hudson Valley tourism spending is growing fastest in Columbia County. The county had a 5.7 percent increase in spending and was the largest increase of any county in the Hudson Valley region. Tourists spent over $130 million in Columbia County in 2015. Tax revenues generated by tourists grew by 6.8 percent in Columbia County, which was also the largest percentage increase of any county in the region. Tourism spending includes food & beverage, transportation, lodging, retail, and recreation, as well as the second home market. Although Westchester County attracts the bulk of visitor spending in the region (more than half), Columbia County’s tourism industry generates jobs and income at a level that saw 7.2 percent of all labor income generated by visitors, with the percentage in all the other counties much lower, at 5.0 percent percent or less. . . . The Historic Preservation Commission is holding a public hearing this morning on the proposal to reconfigure the fenestration on an early 20th-century addition to 314 Union Street and replace the vinyl siding currently on the structure with corrugated metal siding. The public hearing begins at 10 a.m. in the Council Chamber at City Hall. 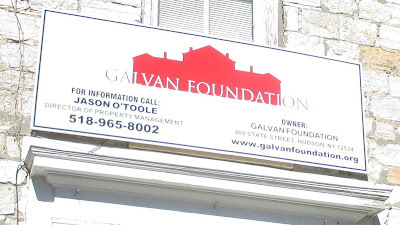 This is definitely an example of the post hoc ergo propter hoc fallacy, but this afternoon, two days after Gossips reported about a sign on 400 State Street that suggested it might be available for sale or development, a new sign appeared over the door. 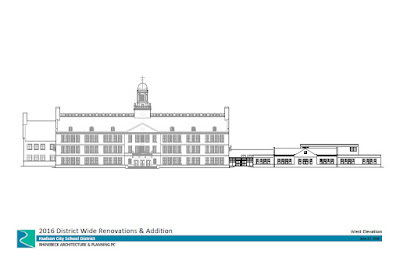 What is distressing about the design proposed for the single-story addition to Montgomery C. Smith Intermediate School is its lack of compatibility with the original three-story Colonial Revival school building constructed as a WPA project in 1937. 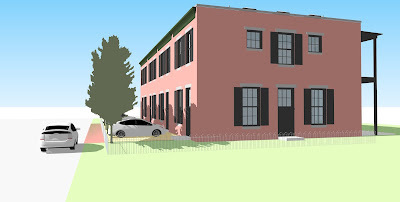 In July, Gossips explored the question of compatibility and concluded that there was no way a one-story addition could be compatible with the three-story historic building: "Form Follows Function." The critical criteria that could never be met were massing, size, and scale. 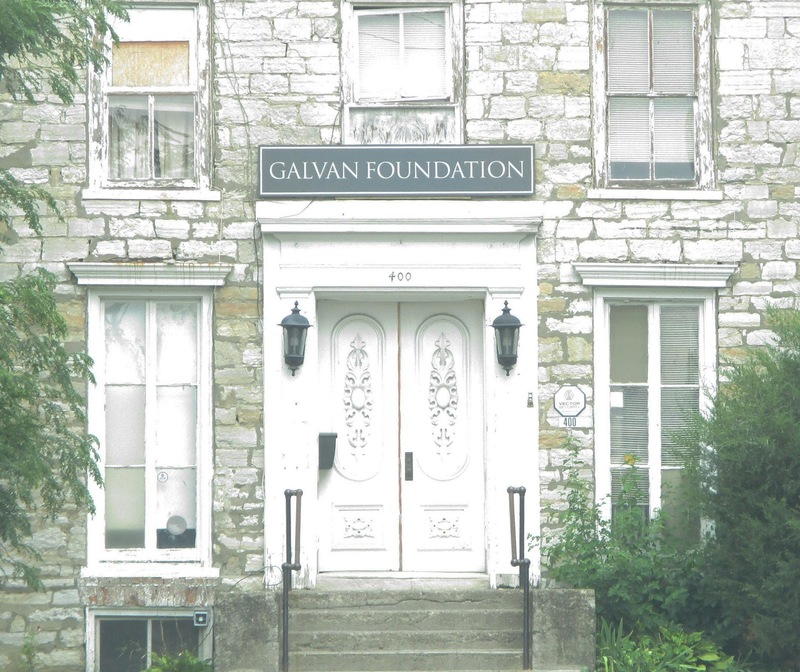 People reviewing the above elevation at a workshop in June suggested that compatibility could only be within the architect's grasp if the building were two stories instead of a single story, noting the admirable compatibility of the 1997 addition that appears at the left in the elevation drawing. 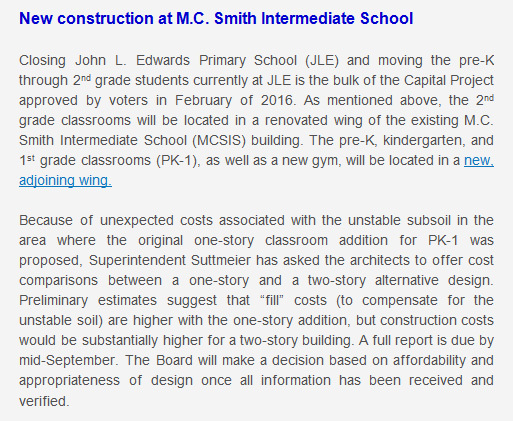 A two-story building may be within our grasp. 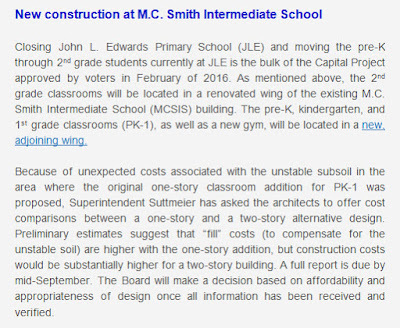 The latest edition of the HCSD Capital Project eNewsletter, distributed this afternoon, announced that because of unstable subsoil on the site of the proposed addition, "Superintendent Suttmeier has asked the architects to offer cost comparisons between a one-story and a two-story alternative design." 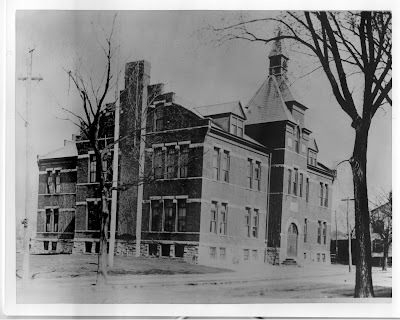 Those who care about protecting the design integrity of the historic WPA school building should keep their fingers crossed for that two-story alternative design. 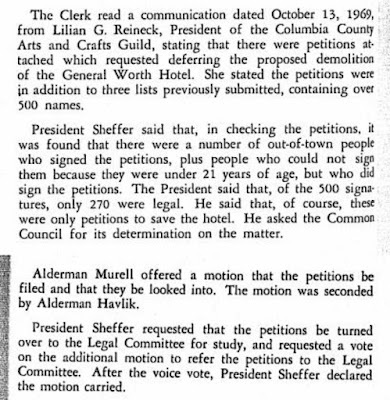 Yesterday, Gossips published an excerpt from the Common Council minutes for September 16, 1969, that recounted Lilian Reineck's appearance before the Council to appeal for a stay of demolition for the General Worth Hotel. At that meeting, she presented to the Council a petition with 95 signatures. 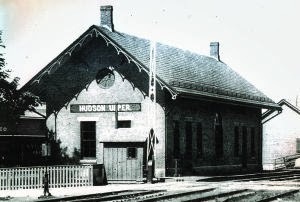 Commenting on the petition, Council president Elmer Steffer noted that "a lot of names would have to be stricken from the petition because the signers did not live in Hudson." At the Council's next meeting in October, there was a communication from Reineck which accompanied petitions with more than 500 signatures. 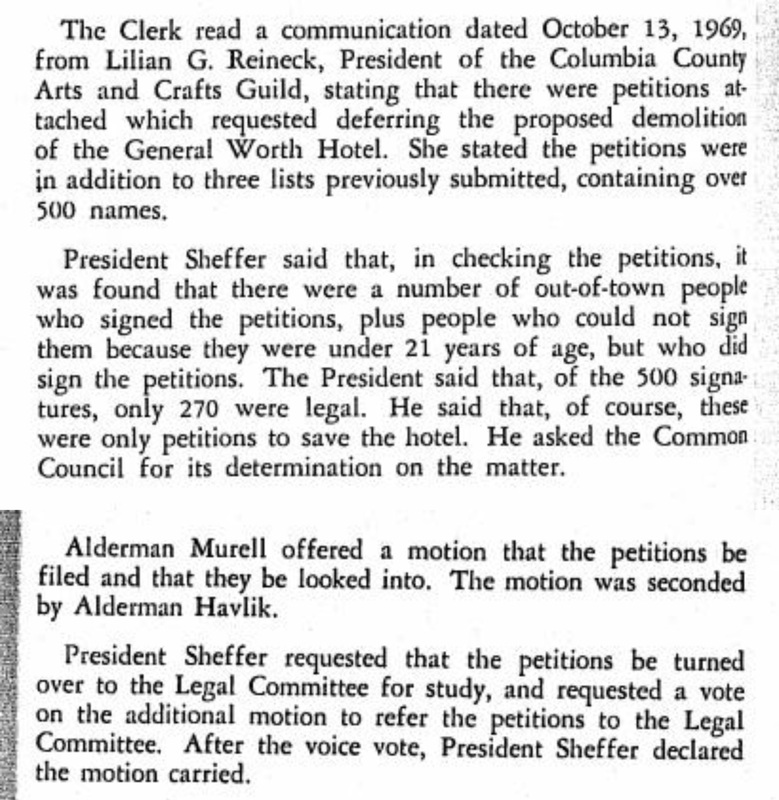 The Council president's response to the petitions was similar to what it had been before--this time declaring invalid not only the signatures of people who did not live in Hudson but also the signatures of people who were not yet 21 years old, 21 being, in 1969, the age at which one became eligible to vote. 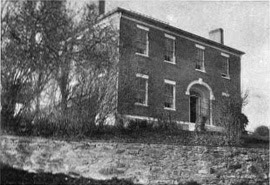 The owners of the magnificent Haight-Van Loan House, on a hill overlooking the river in Athens, recently discovered an article about their house in the June 1906 issue of American Homes and Gardens: "The Gantley House, at Athens, New York. The article, which includes photographs of the interior as well as the exterior of the 1812 house, is fascinating and recommended reading. 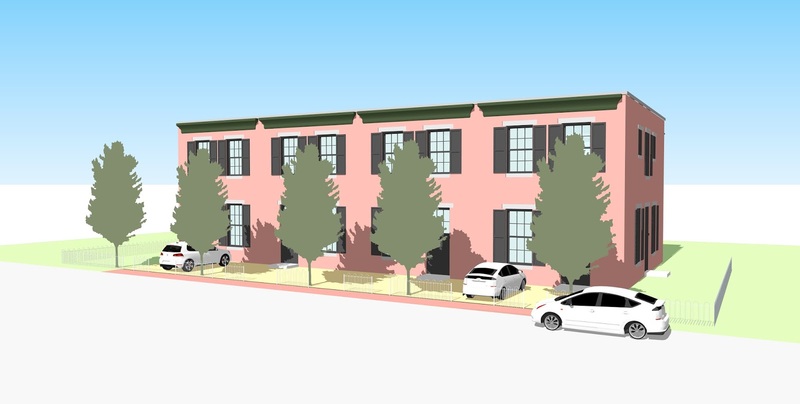 In March of this year, a proposal was presented to the Planning Board for site plan review by architect Walter Chatham, who described himself as a New Urbanist. 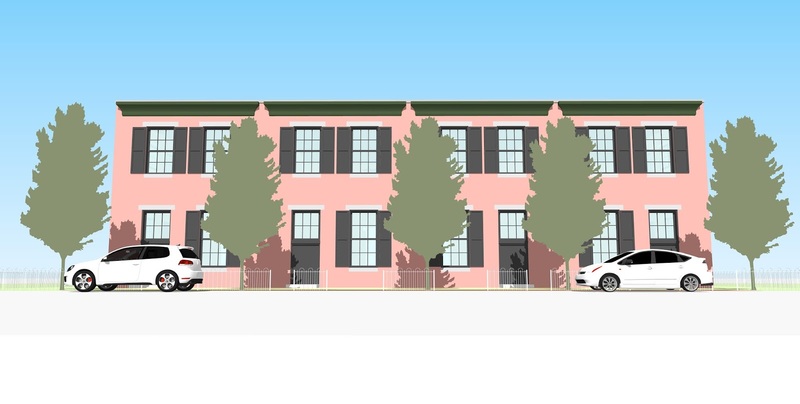 What Chatham proposed was to build four rowhouses in the west side of Hudson Avenue, across the street from Galvan Field. 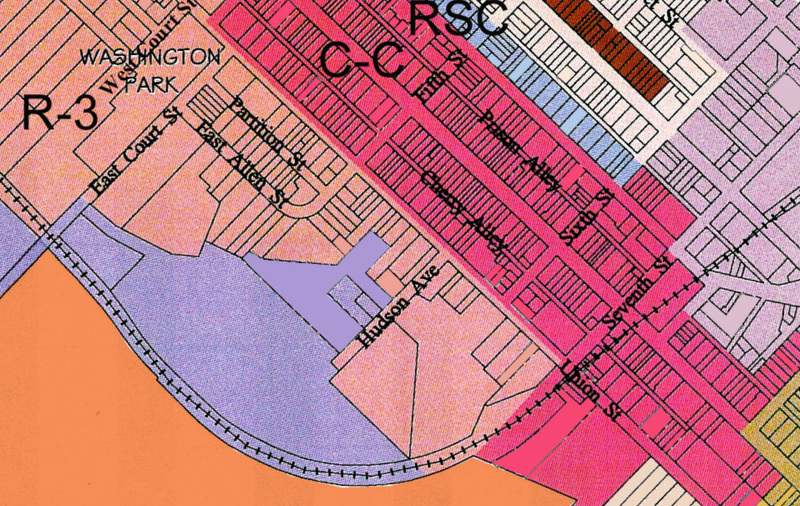 Because half the site of the proposed structures was zoned R-3 (residential) and the other half was zoned I-1 (industrial), the project was referred to the Zoning Board of Appeals for a use variance. 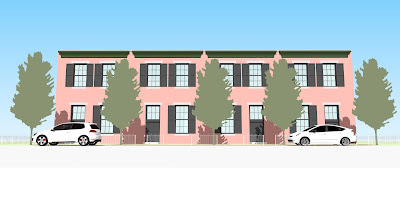 The ZBA, at its March meeting, after granting a use variance for the hotel proposed for 41 Cross Street, denied a use variance to this project, recommending instead that the applicant to ask the Common Council to amend the zoning. Tonight, such an amendment to the zoning code, authored by Third Ward alderman John Friedman, was presented to the Common Council Legal Committee for consideration. Alderman Michael O'Hara (First Ward), who chairs the Legal Committee, explained that the proposed amendment would change the zoning along the west side of Hudson Avenue from Industrial to Residential Special Commercial, the same zoning as on Warren Street, which would allow certain kinds of commercial enterprises to be carried out on the ground floors of the proposed buildings. The Legal Committee agreed to bring the proposed amendment before the full Council in September. 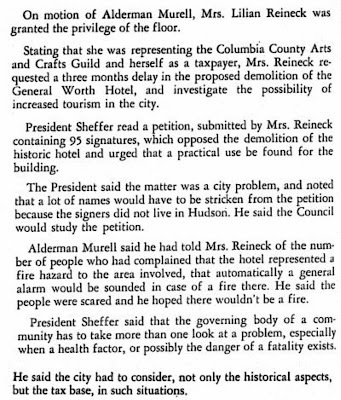 Some pretty heady stuff was going on in Hudson in 1969. 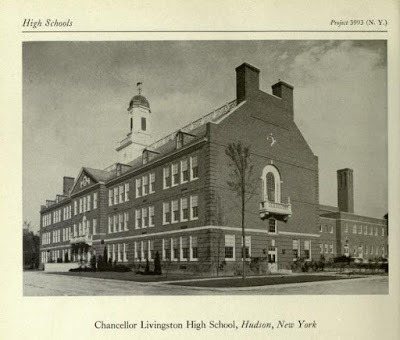 That was the year that the Common Council passed a resolution authorizing the Hudson Urban Renewal Agency to acquire real property in the Urban Renewal Area and another executing a contract for a "Demolition Grant under Title I of the Housing Act of 1949." 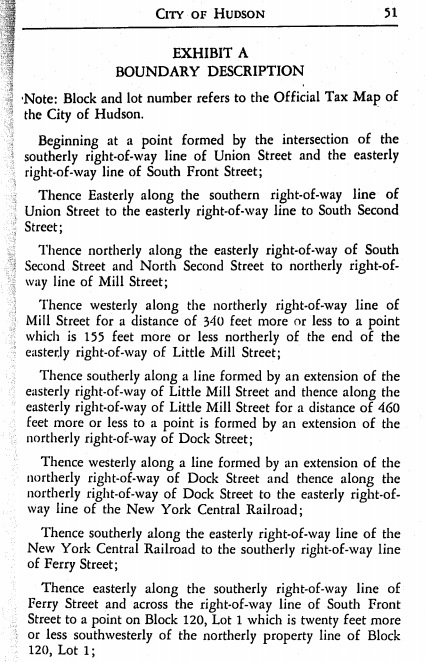 Accompanying these resolutions was the following boundary description for the Urban Renewal Area. 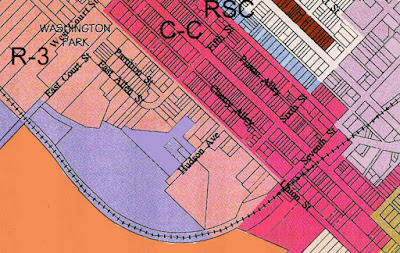 From the description, it appears that the north side of the first two blocks of Union Street, as well as everything on Warren Street west of Second, was part of the original Urban Renewal Area. Obviously--mercifully--much of Warren Street and all of Union Street were spared. 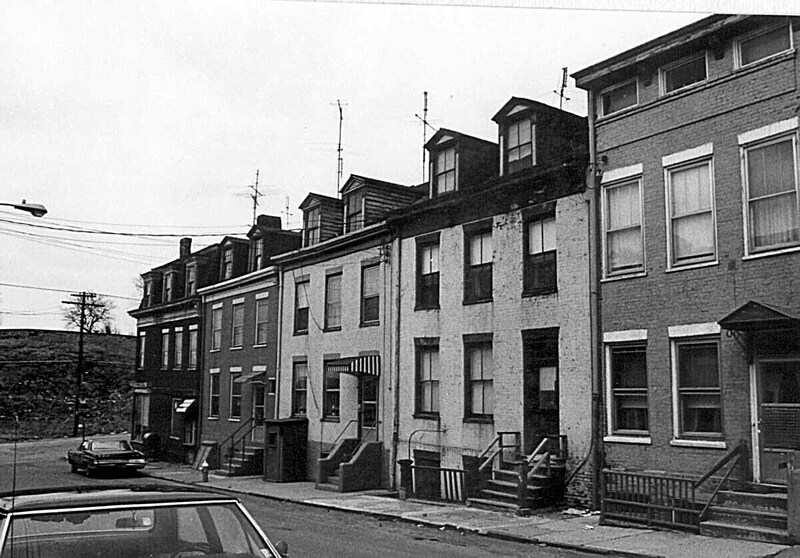 Also in 1969, the struggle to save the General Worth Hotel was also at its height. 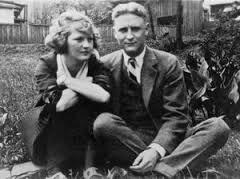 Gossips has devoted many posts to the General Worth, notably this one which quotes an article by Ada Louise Huxtable that appeared in the New York Times on September 14, 1969. Two days later, on September 16, 1969, Lilian Reineck, a local champion of the General Worth, appeared before the Common Council. What follows is the account of what happened after she was "granted the privilege of the floor," quoted in its entirety from the Common Council minutes. 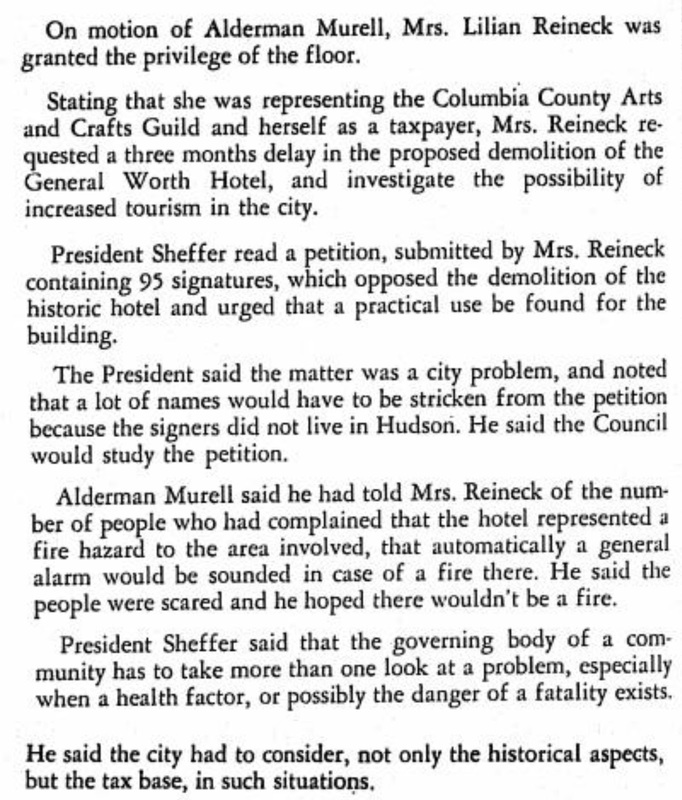 The day before Reineck appeared before the Common Council, there had been a public hearing on the fate of the General Worth Hotel at which James Marston Fitch, from the Columbia University School of Architecture, gave testimony in support of preserving the building. 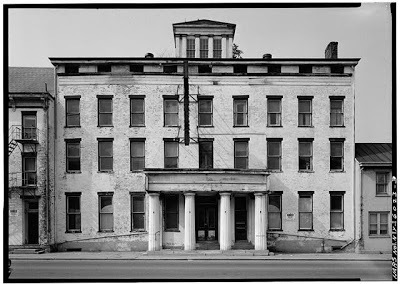 The following year, however, despite all the efforts to save it, the General Worth was demolished. The picture above, taken shortly before the 1837 Greek Revival building was demolished, is part of the Historic American Building Survey at the Library of Congress.